This list was very kindly contributed by Peter BC. Now this is beyond the banalities of the regular supermarket trolley. This list was found in a church! 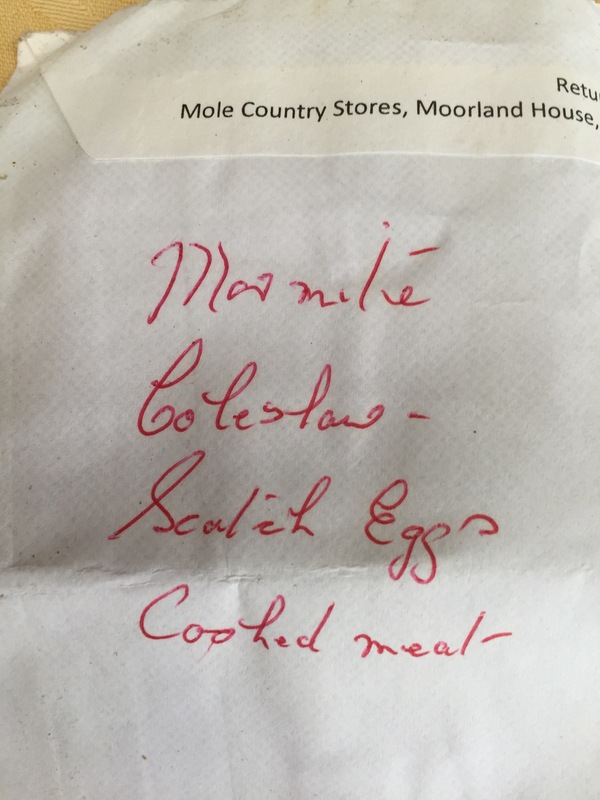 Peter says he was moving the altar in a small church in Lincolnshire last Sunday when he found this shopping list. 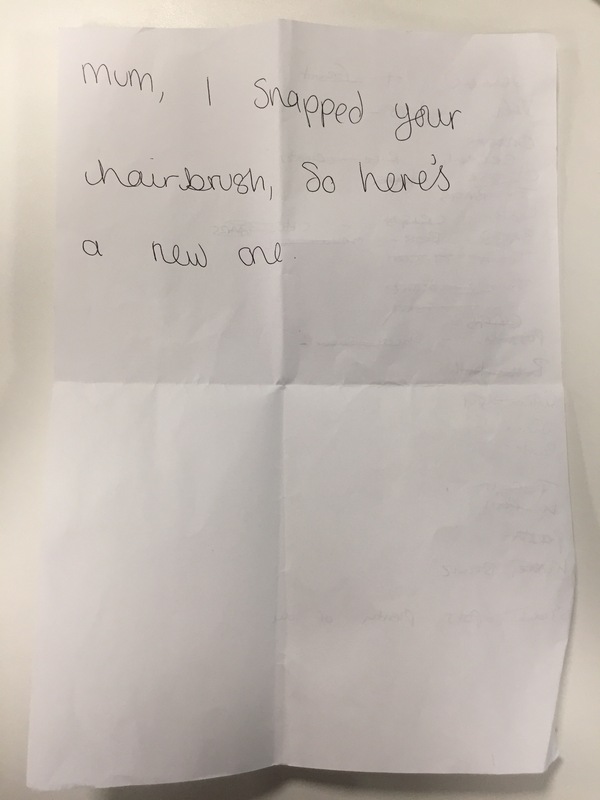 The list was written in red pen – maybe a teacher? The handwriting is neat and formal, probably that of an older person. The slight shakiness might reinforce this point of view. Maybe a retired teacher. Marmite, Scotch Eggs, Coleslaw and Cooked Meat. This are all tea time or picnic ingredients. Thank you so much to Peter! This just in from Yvonne, our own very special Australian correspondent (her blog can be found here). “I was standing in the queue and spotted this list clutched in the fist of the shopper ahead of me. I made her an offer she couldn’t refuse (you don’t want to know), and I became the proud owner of the list. There are many points of interest here, it does indeed to appear to be Rosa’s Birthday and Rosa’s will be getting a scarf and card at least – maybe some eggs too? I am not sure if the carpet cleaner is for her. Now, about the wire wool… The list so far is pretty typical with the usual mix of food stuff and cleaning bits, but wire wool? This is a strange addition, maybe a little too strange as the author hastily crossed it off the list shortly after adding it. The note paper is is great with tea and cakes shown, the handwriting is female. 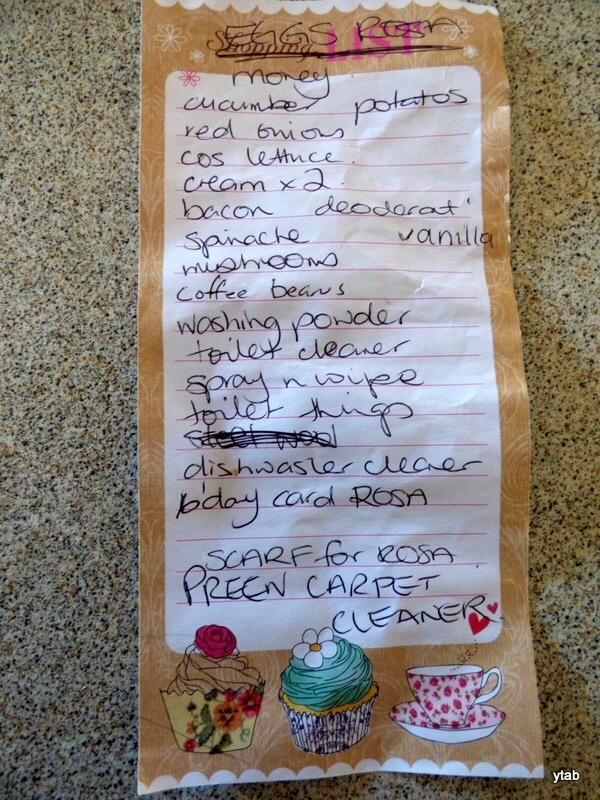 Many thanks Yvonne, what did you have to promise to get your hands on this list? Whatever it was, it is much appreciated. Eggs Rosa, Money, cucumber, potatoes, red onions, cos lettuce, cream x 2, bacon, deodorant, spinach, vanilla, mushrooms, coffee beans, washing power, toilet cleaner, spray n wipe, toilet things, steel wool, dishwasher cleaner, b’day card Rosa, scarf for Rosa, preen carpet cleaner. 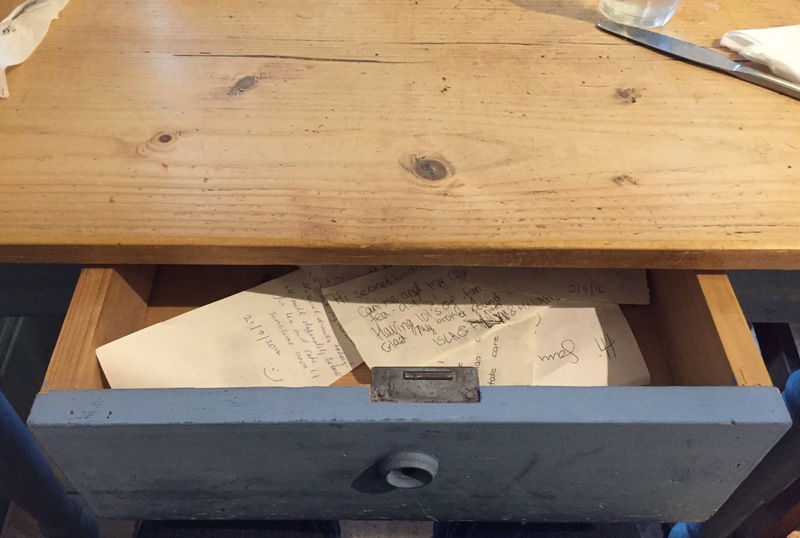 In Wellington Park Café, http://wellingtonfarmshop.co.uk/cafe/ there is a table with a secret drawer. In the secret drawer there are secret letters. 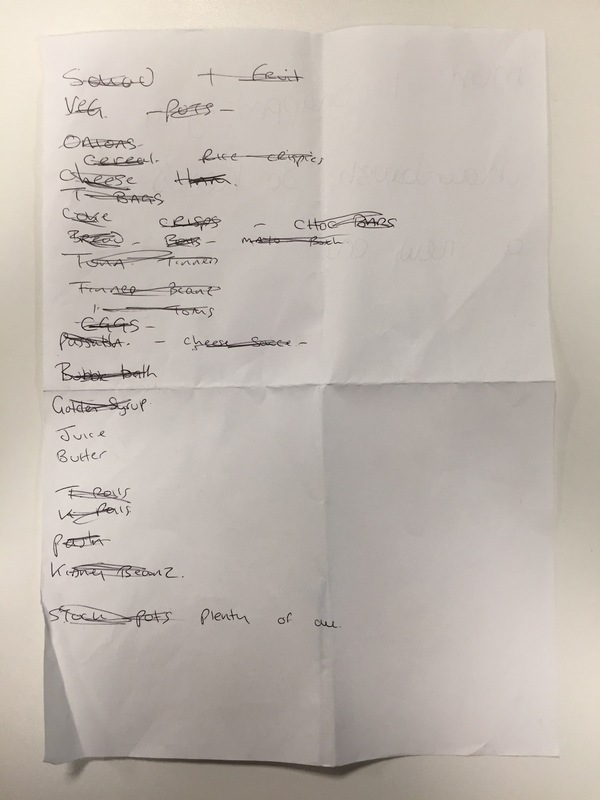 Now, these are not shopping lists but I could not resist making a post to share the secret. 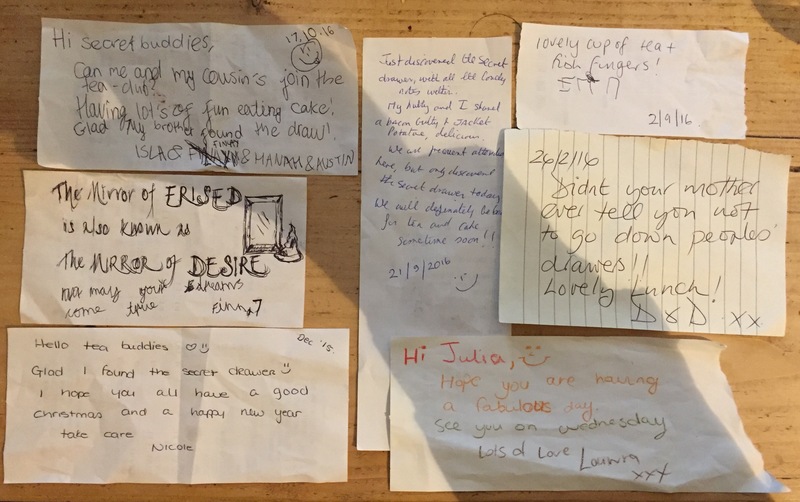 The letters contain many messages, most written on the back of receipts, from all sorts of people, but many of them reference the secret drawer. Below are just a small selection of the messages. If you are ever in this particular café then I think you should find the secret drawer and leave a secret letter for others to find. I did! Kindly dontated by Andy. 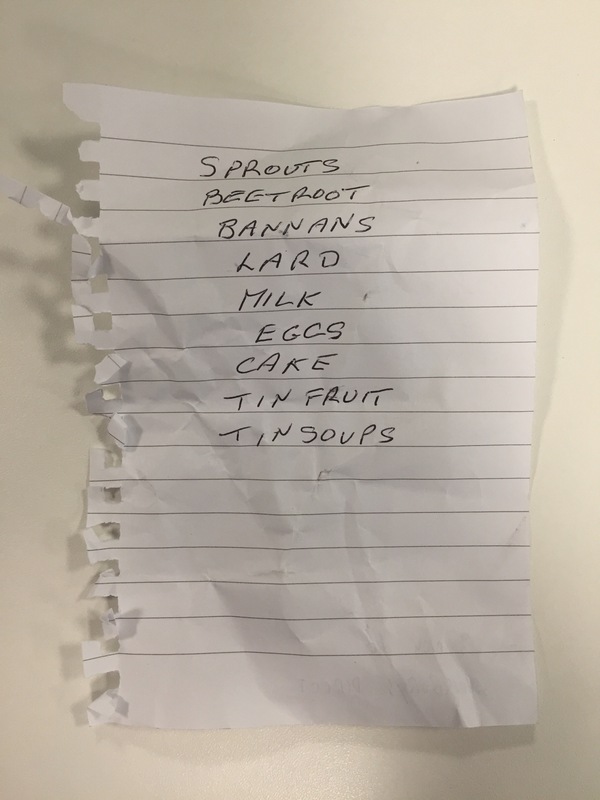 This shopping list was found in a Sainsbury’s in Oxfordshire. This is a bit traditional with lard, sprouts and tinned fruit but the item to note is the Bannans [sic].